Here I am still playing catch up with my recaps; after this we will be all caught up and ready to go for the July 11th episode. 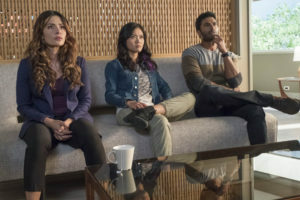 As I sit here preparing for this recap I can’t help but think about how different our lives would be if a program like Reverie were actually available to us. It’s fun to imagine but as we see on the show there are downsides and dangers to the program. Each week we learn a new way the program can be utilized and this week is no different. Technology like this would need to have clear lines because in the wrong hands could be very dangerous. Anyways, enough of my pondering thoughts and onto the recap. Last week we learned how the program can be used to breach security as well as overcome one’s daily challenges, this week we try to prevent crisis. The episode begins by watching civilians going about their lives in a building going through different security protocols and their morning routine. A man dressed in a suit with no patience for the security line walks out of the building to call upstairs to let someone know he is running late. Moments later a bomb goes off in the building. After only seeing a few seconds of the aftermath we are now at Onira Tech. Charlie is walking into the cafeteria to gather Mara with a member of the US Military. Confused by Charlie’s “new friend,” she doesn’t ask any questions she follows him to his office. In Charlie’s office Lexi, Paul, and Monica Shaw are waiting for them. Monica Shaw cuts to the chase there is no time to go over the fine details of what is happening. Before she can begin, however, Mara speaks up because she’s confused as to why Monica Shaw is there at all — she isn’t aware until now that Monica works for the D.O.D. Monica is there to ask them for help preventing a terror attack. They are being brought to speed on the bombing that we saw at the beginning of the episode. After watching a video from the person behind the bombing Monica is sure that there will be another bombing. Still confused as to why Monica is there and how they can help. 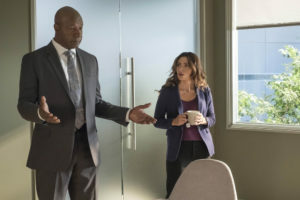 Shaw is hoping that with the Reverie 2.0 program, Mara will be able to go in to the mind of the only surviving member (Denise) of the bombing – a surviving member who also happened to see the person who was carrying the bomb. The catch? Denise is in a medical coma — the doctors are only giving her 6-10 hours before she succumbs to her injuries from the bombing. The clock is literally ticking. Paul questions how they will be able to get the answers Monica is looking for since she is in a coma. “Interesting,” Lexi adds as Monica goes on to explain they will need to use the Reverie program to go into her mind. She explains that her team has reviewed the source code for the program and has come to the conclusion that this can be done. Lexi is shocked to learn that the D.O.D has access to her coding and we can tell she isn’t very happy about it. As the conversation is happening Mara reaches for a manila folder filled with pictures from the bombing. Charlie questions if this is safe for Mara, as does Paul questions if they could even do it. Lexi assures that there is no question that they can do it. Paul doesn’t agree with the ethical side of this because they can’t get the permission from Denise and Charlie points out that they never will but if it works, it would hopefully be able to save many more lives. Paul also points out that they know the Reverie program can’t exist without the mind and are unsure what that means for Denise’s and the safety of Mara. At this point Charlie says they won’t do it but Monica leaves it to Mara to make a decision. Mara asks Monica is she believes there are more bombs, “100%.” Knowing this and despite know that Monica intentionally left the pictures there for Mara on purpose — knowing she’d make an emotional connection, Mara says, “I’ll go in.” Now walking in the hallways with Lexi and Paul, Lexi is going on about “noradrenaline.” Confused, Mara asks what noradrenaline is and Lexi throws it to Dylan which he informs is a hormone that stimulates where memories are formed. 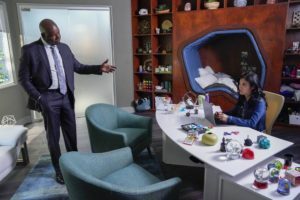 Now in Lexi’s office, they create a game plan on how they will be able to use the security footage and the program to recreate the scene before the bombing took place so, in Denise’s mind, it will be like she is still there. Unfortunately, Denise is the only one who saw the bombers face so they are hoping that the program will be able to fill in the gaps there from her memories. Mara is wondering how she is going to be able to help during this, they are hoping that if the program can fill in the gaps she will be able to see what Denise saw before the bombing took place. Lexi realizes that Denise’s neural interface is going to go “haywire” and could become very overwhelming for Denise while Mara is in her mind with the program. After coming to this epiphany, she realizes she will have to tweak the code and Paul heads off to the lab to start creating the lobby from the security footage. Mara is left standing for a few moments before leaving. Paul is talking with the technicians that they do not have a lot of time to create what he is about to give them and that he can’t answer any of there questions as to why. By the obvious presence of the military, what they are doing is classified. Dylan let’s Paul know that he has given him the lobby security video. Paul explains that everything they do for this program needs to be done to perfection — exactly like they see from the security video. Since they only have the security video to go off, they will have to do a little bit of guessing to figure out where the 360 degree versions of the people in the lobby. Paul is going in and out of the program to help figure out the missing pieces of the the lobby to make sure they have it 100% before they install the BCI. While Paul is working with the technicians, Mara is in with Denise watching her. Paul, Lexi, and Charlie enter Mara’s office as she is looking at look at Denise’s ID badge. Paul is going over the changes to the program and where Mara will be able to find the escape mandala in case she were to need it. Apertus. Mara is in the lobby looking around, she spots her exit Mandala noticing how bright it is and moves a plant in front of it. As she backs away she bumps into a father and daughter and she flashes back to seeing the little girls shoes in the pictures she saw from the original meeting with Monica Shaw. This interaction causes Denise (Ashleigh LaThrop) to notice Mara and heads toward her. Denise is confused as to what is going, she feels weird. Mara tries to brush Denise off and just become a face in the crowd waiting for the person who was carrying the bomb to arrive. In the meantime Charlie meets with Monica, he isn’t having what Monica’s serving regarding her agenda for the program and saving lies. He thinks that Monica was just trying to pull her weight with the DOD and get the program used for something it wasn’t ready for yet. 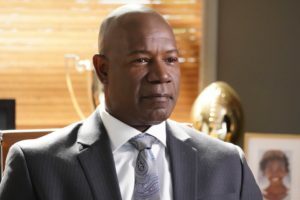 At the same time he is also trying to protect Mara as she may not be ready for a mission like this; Monica believes that Charlie is holding Mara back and protecting her too much. She thinks that Mara is going to shock everyone with the work she does in the program. Monica wants to see the Reverie program be used in another way for the military by helping vets with PTSD. As she goes to continue, Charlie interrupts her but calling it what it is, “intelligence gathering” –there it is, what does Monica Shaw really wanting from the program.– Monica turns it around that yes, she needed Mara to use the program to gather the information she needed to prevent loss of lives. In a Onira Tech conference room, Dylan is informing the team who “Denise” actually is which is Ashley Trent. Paul wants to know why this wasn’t caught sooner, turns out Denise’s medical status was never updated and the security company filters through many buildings and doesn’t know employees on a personal level. Ashley took on Denise’s identity to make sure that “Silas” was able to get through security with the bomb. Mara can’t believe this to be true, the person she talked to inside of the program does not feel like the type of person that would do this sort of thing. Lexi wants to know why this is still being talked about, they weren’t able to gather anymore information. 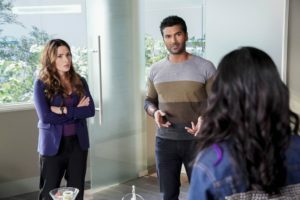 Monica wants to find out who Silas is and stop them, now that they know Ashley is connected to the bomber, they should be able to find out who this person is or at least that is her hope. So to Monica, at least, they are not done. Lexi doesn’t agree with what they are doing and walks out. Mara knows that she has the ability to go back in, but Ashley is on the brink of succumbing to her injuries and it could be dangerous for Mara to go back in. Mara knows the risks except before she goes back, she wants to know more information about Ashley. Charlie tracks down Lexi to talk to her about how she is feeling. How is Lexi feeling? Well I’m going to tell you, she’s mad. She feels as if she is being pushed around in her own company, that he gave the source code to Monica and didn’t even tell her. Charlie responds that Lexi never wanted to know about the stuff that went on behind the scenes; well, not anymore. Lexi wants to know about what is going on. Charlie snipes right back at her that Lexi needs more than her vision, she needs to take the time to look up and see what is happening around her and be apart of it. Before Charlie can finish everything he is trying to say, he decides that he is going to take Lexi with him somewhere. In a courtyard, Mara is meeting with Ashley’s mom (Anne-Marie Johnson) to try to gather any information she can to help communicate with Ashley and not startle her. Ashley’s Mom goes on to explain that the Ashley she knew, she was fun and spirited. Then one day her dad destroyed her family and the lives of many others. Her mom tried to protect her but she knew better. Eventually Ashley and her mom lost everything. Her mom tried to get her help for her anger but it didn’t work. Soon after, Ashley started running away. Come to find out they hadn’t seen each other in over a year. She can’t believe that this is her daughter. The Field Trip. Charlie has taken Lexi to talk to Edith Leonard (Alison Rood) — one of the only people that Ashley was in communication with. Lexi responds to the idea that Charlie can go in and she will stay in the car, Charlie takes her phone. –Sorry Lexi but you are going with him.– Lexi hides behind her phone and Charlie isn’t having it anymore. At the door a woman answers and wants to know the purpose of Charlie and Lexi being there, Charlie catches on for an excuse to go back into the house and after a few seconds follows her inside. Lexi follows Charlie and notices on a table, the picture used of Ashley for Denise’s ID badge. Charlie takes off to the back of the house and into the backyard where Edith is trying to escape over a fence. Falling from the fence, Edith gets up holding a gun toward Charlie and Lexi. Trying to explain to Edith that Ashley is still currently alive, she won’t believe it tho because Silas got to her first telling her she sacrificed herself in the bombing. By the time Edith finishes explaining the reasoning behind the bombings, she puts the gun to her head and pulls the trigger. –Wrong time for a ride along for Lexi.– When Charlie turns and looks at Lexi she has almost a lost expression on her face. Once again at Onira Tech, in Charlie’s office, Monica fills Mara in that with the information they were given from Edith that the next bombing could happen in hours. Mara is ready to go back in and talk to Ashley. She even has a plan, before entering the Reverie, Paul warns that she should keep conversation to a minimum as they were flying blind with her voice. Apertus. Now in the Reverie library we see Mara looking in a mirror and looking back at her is Edith. –Interesting move Mara.– She now opens the door and is in lobby of the building. Ashley spots “Edith” right away and embraces her, to only become confused as to why she is there. Ashley is catching onto the fact that the place that she is, isn’t right and people aren’t functioning like they should be. Ashley wants to show “Edith” something and pulls her down a hallway. Ashley asks “Edith” to open a door and on the other side is forest and a log cabin, not your normal storage closet. Playing along with program and plan, “Edith” lies and says it’s just a closet. Ashley begins to unwind a bit. “Edith” tries to reason with Ashley and tell her that the bombing is wrong and that there is still time to stop this, Ashley begins to not feel good and passes out. Exitus. Paul is there waiting for Mara, it was a close call but informs her that Ashley’s lung collapsed and her organs are beginning to fail. Seconds later Monica Shaw bursts into the room and asks her if she was able to get any more information that they are looking for. She wasn’t able to get anything. Monica isn’t happy, she was hoping for confirmation on a tip and storms out of the room. 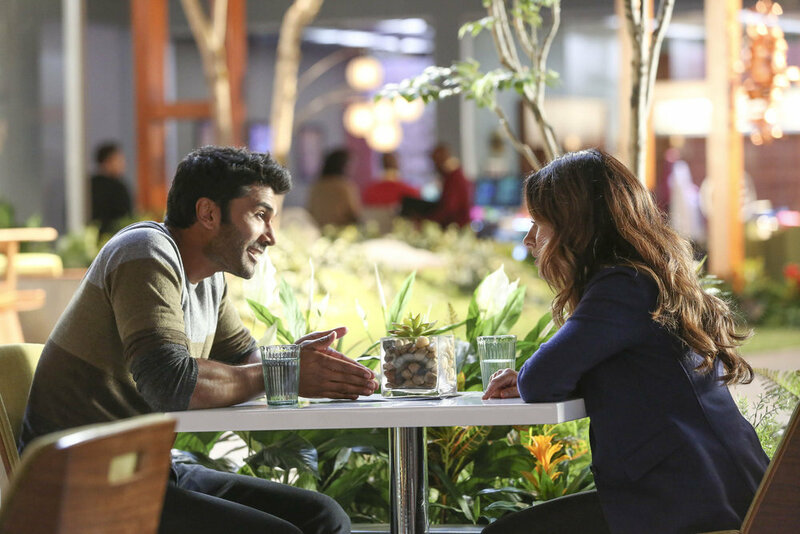 Now in the cafeteria, Mara is talking to Paul about how she thinks that Ashley didn’t want to go along with the bombing and that she wanted to stop it. She also tells Paul about what she saw behind the door in the program. Paul is absolutely fascinated by this because Ashley’s brain is traumatized and it’s working beyond that. Her brain isn’t accepting the Reverie they built so it’s building its own. “A refuge,” as Mara called it. 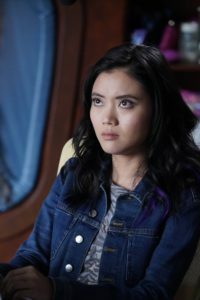 Mara wants to go back in one more time to help Ashley come to peace with what is going on but Paul warns her that she can’t get stuck inside the Reverie if Ashley’s body gives up. She’s willing to take that risk. Mara goes to Ashley’s room to talk to Mama Trent. Mara asks her about the log cabin in the woods. Ashley’s mom goes onto explain they had a cabin when she was little. They built it as a family and would spend a lot of time there. They would roast marshmallows and read Alice in Wonderland — her mom found out Ashley still reads the book. Her mom came to realize that she thought she was protecting Ashley from not telling her about what was going on with her father but in the end it never helped her — indeed, it never allowed Ashley to ever be able to trust anyone, she always questioned if she was being lied to. Mara is ready to go back in one last time to help Ashley. Apertus. Now in the lobby, the people who previously were moving within the Reverie are frozen. Mara hears birds chirping and follows the sounds to the cabin in the woods. While Mara is in the Reverie, Charlie gets a call from Monica the tip they were looking into was a hoax — they were lead on a wild goose chase. Monica wants to know where Mara is, he doesn’t know and he is looking for her. –Oh Charlie, if you only knew where she was.– Mara enters the cabin to find Ashley sitting by the fire. Ashley is concerned that Mara is there to get because she’s with Silas’ people. Ashley is falling apart and Mara understands and works to connect. Mara is there to tell her the truth of what has been going on, she explains the Reverie program that they created. Ashley is immediately confused and asks questions, Mara does her best to answer them. Mara apologizes to Ashley about taking on the form of Edith because she needed to get information out of her and that wasn’t fair. Now Mara tells Ashley that she is in a coma. Ashley asks if she is dying, Mara nods and Ashley says she can feel that she is dying. Now she wants to know what happened with the bomb going off and becomes upset. Silas lied to her, he said that no one would get hurt. He promised her but took advantage of her vulnerability from her past. Mara goes on to tell her that her mom doesn’t blame her, she still loves her. Ashley is surprised Mara has met her mother. Mara tells her that she is there with her at her bedside. Ashley goes on to explain that everything about that day didn’t go the way she was told it would. Her job was to get Silas into the building and receive the bomb from him. She was to place the bomb in the service closet, it was supposed to go off 9 hours later when no one would be there, but she looked in the bag and it had been set for 45 seconds. Mara is now digging deep and telling her she has the chance to help save others. In this moment the program begins to shake. Ashley shares where the next bomb is going to go off. The program shakes more and Ashley tells Mara she thinks she should go. Before Mara can leave the cabin, Ashley tells her one more thing. As the program starts to glitch as we’ve seen before, Mara tries to use Exitus but it doesn’t work. She now knows she needs to get back to the escape Mandala — RUN MARA RUN! !– She makes it out but only just. Mara enters Ashley’s room. Her mom is there on the edge of Ashley’s bed with the Alice in Wonderland book nearby. Ashley has died and Mara moves closer and gives her her condolences. Mara sits down next to her. Mara explains why she asked about the log cabin and that she was able to save lives by telling them where the next bomb would be. “Lady Bug loved you,” was the last thing that Ashley told Mara before she passed. Mama Trent tells Mara that Ashley hadn’t called her that since she was a little girl. Then Mara picks up the book and reads an excerpt from the book. Lexi is in her office when Charlie comes in to check on her. He wants to remind her that the way they used the program saved a lot of lives. He also goes on to tell her a story about one of his friends who made a bad decision and Charlie couldn’t help him. His friend fell off a building because he was high. This was the first person he ever saw die. He apologizes that Lexi had to be there to see the decision that Edith made and if she ever wants to talk about it he is there. “Edith wasn’t the first person I’ve seen die,” Lexi responds. Charlie knew this already but was still being sympathetic of the situation. In the cafeteria the team has gathered and Monica brings in a bottle of whiskey in congratulations. Monica thanks Mara for her hard work. Lexi joins the team for drinks. They each take turns thanking something/someone in their toast a job well done, to the program, to team work, to Steve Jobs … to Ashley. Well this episode has so many feelings towards it and I could write another six paragraphs explaining them all but I’m going to try and cover it in a condensed version. For starters, Monica Shaw I do not trust you, I do not like you and whatever it is you are after — not a fan. (Disclaimer: Kathryn Morris you are wonderful). There are so many ways that the Reverie program can help the users and be used for an experience. Now if I started to list the ways that the Reverie Program could be used if it were to get into the wrong hands … well, suffice it say, it would be disastrous. I feel like I see the end game here and I don’t like it. Now that aside, they are using the program to gain access and information without consent. Morally this is so wrong but for the sake of saving lives, it makes sense. The grey area just got larger in this episode. Thankfully, we were able to see Mara work her magic with time and get what they need and bring Ashley peace for herself and to her mom. This had to have been a hard episode for Mara knowing the things she does from Oliver Hill and having doubt in the back of her mind. Lexi has every right to be upset about not knowing important things, regardless of her not wanting to know everything. I think it was owed to her to know who all has access to her source code. I think it will be good for her to be involved in more and not just working in the background to advance the program. At the very end of the episode I think we were given a little bit of important information and I can’t help but wonder if it has anything to do with Dylan. Two weeks and we will be back with a new episode. In the meantime I hope everyone enjoys their holiday. Until then … Exitus. 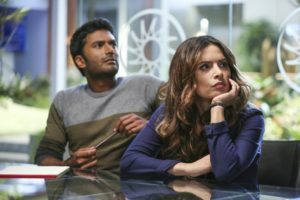 Previous Previous post: TV Recap: Reverie – Who is Oliver Hill?